Updated August 25, 2014 with final permit application. Sunrise Coal, LLC has filed Permit Application #429 with the Illinois Department of Natural Resources Office of Mines and Minerals (IDNR-OMM) for the proposed Bulldog underground coal mine. As of August 2014, the permit application has been deemed to be complete by the IDNR-OMM. Public notice was first posted in the Sidell Reporter on July 31, 2014. To promote transparency and accountability in the permitting process, stakeholder groups have downloaded the current permit application from IDNR-OMM. These materials have been made available here to ensure that local residents and the decision makers who represent them have full access to the details of the proposed coal mine. File names have been clarified for easier reading. The original permit application that was filed in July 2012 has undergone significant changes and can be viewed at the bottom of this page. The official permit application may be viewed on the IDNR website (Click on “Permit” in the line for Sunrise Coal). 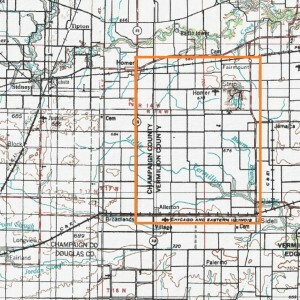 The underground mining is proposed to take place in the area outlined in orange on the adjacent map; for more detail, click here to view the proposed shadow area map. The proposed location of the surface facility is in southwest Vermilion County, and can be viewed on this map. A more detailed view is available on the proposed operations map. The mine would be located on some of Illinois’ best farmland. It would also be in close proximity to the communities of Sidell, Allerton, Broadlands, Homer and Fairmount. All of these communities except Broadlands rely on groundwater to supply their residents’ domestic needs, as do the rural residents who live in the area.